Sofiya is 2 today and I can’t help but feel happy yet sad at the same time. She can’t even crawl yet let alone walk. Her grip strong, yes, showing strong hand and fingers but it also shows that she is just like a 10 months old baby when she’s already 2!!! She understands bye-bye and wave when she has to eventhough Wall-E can perform a smoother waving movement. Her steps are getting firm and both legs were no longer wobbly like before but toddlers her age should be running around like nobody’s business and she could only do it when she’s in the walker. I am happy that she started calling out to me even though the only sounds that she makes are “aaaaaaa”, “dididididididi” and mostly “ wuuuuwuuuuwuuu”. Yes I am happy but I know I am angry. Yet, I love her so much like other mothers love their children and if, she is fated to have her development delayed or even stays like this forever, I still love her deeply. Feelings of mothers who has OKU status children are a bit different from mothers with normal kids. I know because my firstborn is alhamdulillah normal. It feels like i want to shelter her forever and as to my son, i want him to explore the world. ….and please in my daughters’ case, stop giving free unwanted advise on pursuing the case with hospital WITHOUT showing how, why, who, when and what. I have no clue where to start and I don’t need people to confuse me further. Not that I want to sue the hospital people but like I said, I have my doubt. Doubts are never good. Must clear it. Anyway, Happy 2nd Birthday Dalili Sofiya. You are loved and we will face whatever may come together including mommy being zombie while waiting for you to sleep at 3 am. ok. Off to Malacca we went for Nafisah's wedding at Sg Udang. My instruction was : Lookout for Alor Gajah's exit as it i nearer to Sg Udang". The moment i opened my eyes, we were at Ayer Keroh Toll gate. Dont get me wrong. I love Ayer Keroh but helloooooooooo....."There was no Alor Gajah exit. 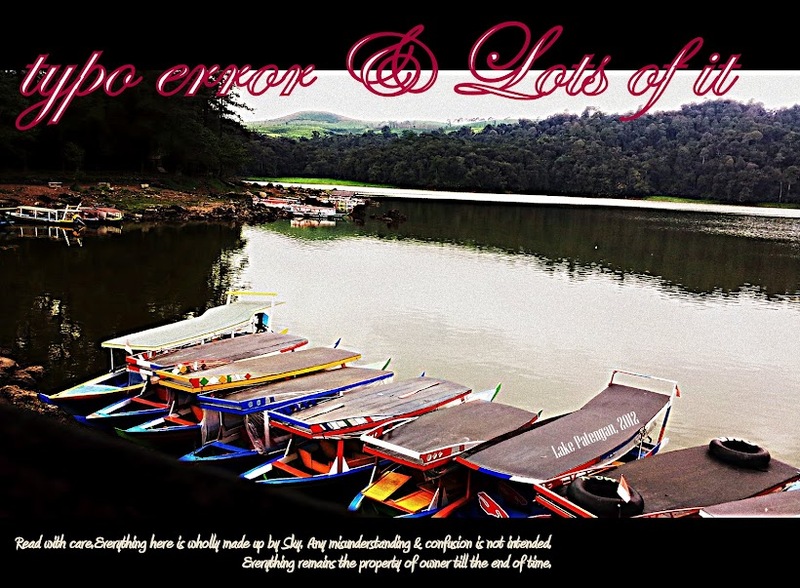 only Simpang Empat!!!!" ok. forgiven. My hubby's not familiar at all with the southern area. 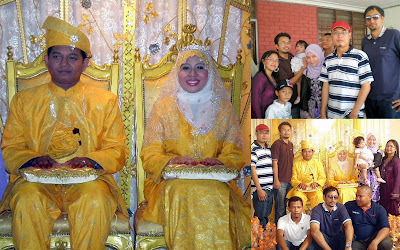 Nafisah was clad in a yellow baju pengantin and damn girl..u looked gorgeous. but err....i've warned you not to smile broadly like that when you see us. Just smile sheepishly. Very not good in following instruction , ey? anyway, have a blessed wedded life and Azreem, you're one lucky man. Next plan was, Burnt Fish dinner (ikan bakar la dowww). Planned in Umbai and hence, it was only logical to move to Malacca centre. I knew it was CNY holiday but hey, takkan la not even one room takde. So, my luck, we spotted a decent hotel in Melaka Raya plaza area, a block away from the infamous Plaza...erm...i forgot..behind Melaka Parade la senang. 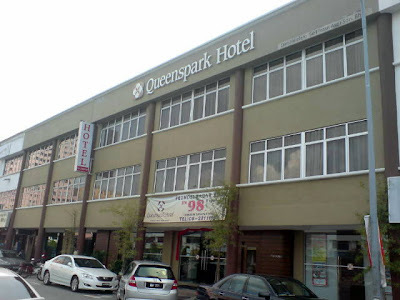 The name is Queenspark Hotel and the rate is not bad at all. 2 queens-sized beds at RM250 jek..public holiday of course mark-up ma...go here for the hotel info. Tukar baju segala yang patut, it was time to meet up with the gang already. So, we convoy to the infamous Ikan Bakar area in Umbai. So, as usual, as long as the bill is on somebody else's tab, we just eat all we could!! Picking the fish was easy as i didn't have to!! it is my weaklink (ewaahh) and i got the others to dothe honour. bla-bla, it's dinner time. But wait..where's yatie? dah balik. ok. gone. the most VVIP: hafizee. OMG!!! not here yet???? ok, few phone calls later, he managed to find the place. uh, did i mentioned we anxiously & excitedly wait for him because it was his treat? nganganga...while waiting and snapping stupid pics here and there, i felt a drop of water. wait, can't be raining because of a drop. But one look at the horizon, it's gonna rain. 15 minutes later, i knew it!! toldya...it was raining and while people were scrambling to get inside, we managed to secure the boat...waaaaa..so special one....except takut aku jatuh dalam air paya tuh coz the "bridge" looked..insecure..
makan2 and said goodbye 3 hours later, i was determined to visit places i've never been before. 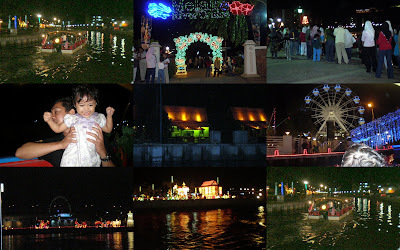 So, we drove around the city, eyes wide open for CNY night view in Malacca and damn, we missed the jaywalking street. Nvmd. nnt mesti gue shopping lagik.I love the view of the lanterns, people sighseeing and sigh of westerners lepaking at coffeeshop. The next day was embraced with more excitement as i saw a certain hill one the way to Umbai the day before. But wait, must get adrenaline rush first and i think this one is a kenot-miss-one!!! Malacca's very own Taming Sari Tower. 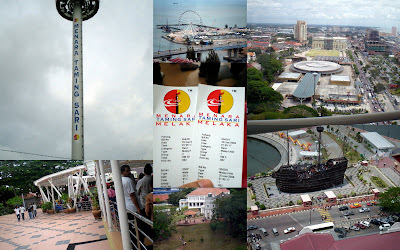 With RM10/adult & RM5/child, you can view 360deg of Malacca (kalau rabun , pakai spec la, rugi taw). The platform will rotate 360deg upwards slooooooowwwly and will stay rotating at the top for few minutes and go downwards again (yela..mana lagi??). It was worth it and i managed to get the video throughout the whole interesting yet made-me-screamed-kenot-feel-my-legs experience. 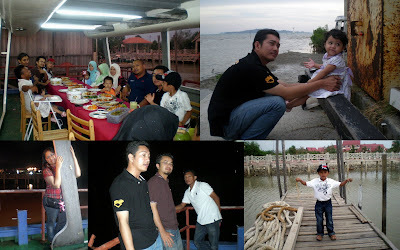 Next, if i couldn't fulfill my destiny as real pirate, naik kapal pun jadikla. This ship is non other than Fleur De La Mar "It was not ordinary trip. 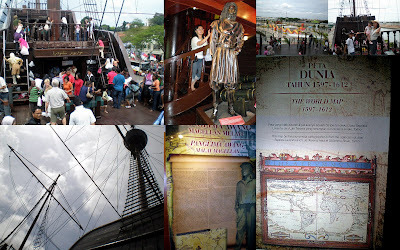 In 1512 flagship “Fleur De La Mar” of Portuguese squadron sailed form Malacca Sultanate placed on south-west coast of Malacca peninsula but never reached the land.". I tried google but the search came out with no satisfactory result. How i wish the whole history while i had the chance. No wonder i cant find...it's not Fleur De La Mar, it's Flor De La Mor. wikipedia here. It's a very interesting tour since they also highlight about Panglima Awang. What i didn't know was, he was actually only a slave aka hamba. Some say he's a Sumatran, a Malay, hailed form Cebu but Enrique of Malacca was a native of Malacca City. Hence, knowing Malacca was the tradecenter for SEA back then, it was only natural that Malay was the lingua-franca and widely spoken. By the way, ability to converse in Malay does not mean we're Malay. So, maybe he's not even Malay? I remember he was also said to be an interpreter. apa2 la kan. kalau nak cerita memang panjang. try wikipedia or buku sejarah la senang. Ok. Remember i mentioned about a certain hill i saw on the way to Umbai? yeap, St John's hill. I also don't know how to illustrate the way ut maybe google map can help. I've been to St Paul's countless times and St John's to me a new, non-crowded place. When i reached there, it was around 1700hrs and there were people jogging uphill. Nevermind that. Only a handful of people actually visit the area at that point of time and i took my own sweet time examining the rocks, whatevernot. I kep looking for the view to the sea but alas, nowhere in plain sight. 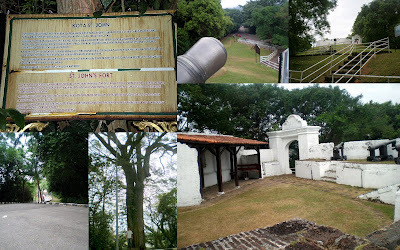 Yes, you could actually pretend to be Dutch and lookout to the sea through the trees and watch out for Bugis and Portuguese invasion. 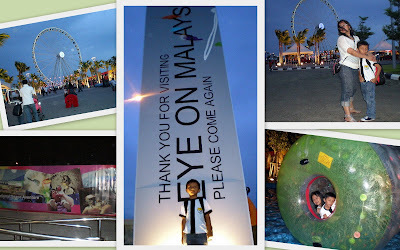 Our next destination was obviously the Eyes of Malaysia in Malacca. 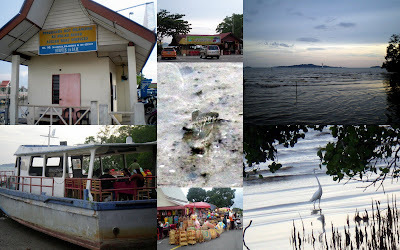 Read it right as there is another Eyes of Malacca. You can see the local wheels while cruising and yes,it is rideable. hehe. They have few other games in the compound but didn't manage to visit all. It was raining when we board the much-talked-about Eyes of Malaysia and i couldnt see a thing clearly. So.no point taking photos also. The best part of taking the ride at night was i lessen my OMG factor by 15%. I am terrifiedof height and yet, i wanna ride all those, wall-climbing an then scream my heart out later. kua kua kua..
We wanted to stay one more night but since we had no reservation done and it was CNY makan besar night, we might as well forget about it. We did try a few hotels though and damn, it was marked up like nobody's business and the names of the hotels also sound like what aa...urm not known la senang.... All the renowned and reliable hotels were fully booked except apartments. Tired, we slept in the car at a R&R and only to wkae up next morning and voila..the HIghway Hotel stood majestically in front of us...awat la x perasan...sempat lagi singgah & menhabiskan duit kat Nilai 3 sat..
i have tonnes to update. Nothing serious. I can never write like those serious blogger on the net. and i do not usually indulge in responding tagging until recently-itupun dalam facebook. But what i'm gonna update will update everyone concerned enough (or busybody enough??) my recent whereabouts and activities. but not tonight. i've been battling lack of sleep for the past week and it's 1.21 am and sofiya is sleeping soundly. finally!! i expected her to wake up...like 15 mins ago. yeah, she loves to either sleeps very2 late aka 2am or wake up at 3am. your choice.